Fall time means green chile time! The weather here in New Mexico starts cooling down in October just in time for Balloon Fiesta and baking with green chile. If you a typical New Mexican, then your freezer is full with green chile. Last month was green chile time and all the grocery stores sold green chile in big sacks. The chile roasters were going non-stop roasting the fresh green chile for people to take home. Since green chile season is such a short time, most people buy 30-60 pounds of green chile and then freeze it so they have that wonderful pepper year round. You see we New Mexicans love green chile and we eat it on most everything. 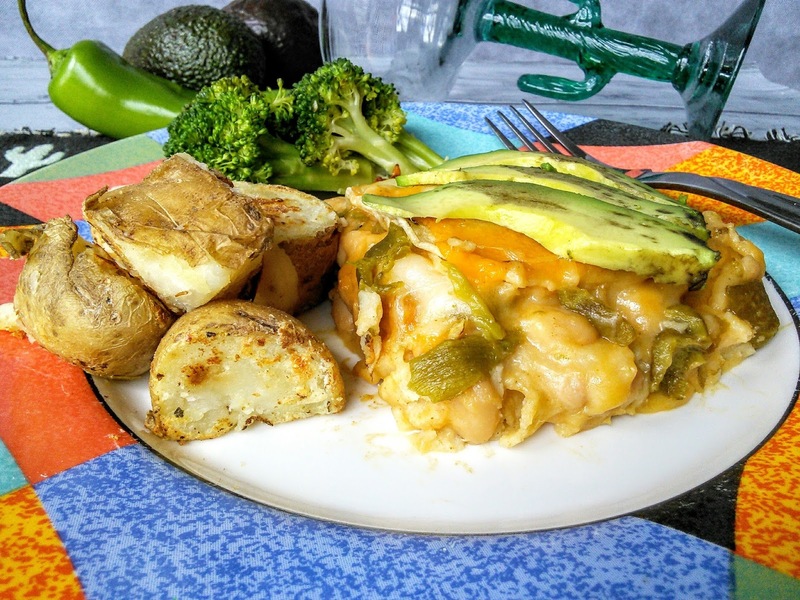 My favorite dish to make with green chile is enchiladas. Now that it is cool enough to turn on the oven, I have green chile enchiladas on my mind. Most people in New Mexico use chicken and cream of chicken soup in their enchiladas but not me as I don't eat meat. I like to use white beans in my enchiladas. The other day I was at Walmart and I spotted Bush's Beans White Chili Beans on the shelf and I was like where have these been? How is it I never noticed these white chili beans in a mild chili sauce? I knew right away that these chili beans would be perfect for my green chile enchiladas. I knew the sauce in the Bush's Chili Beans would be a great sauce for my enchiladas. 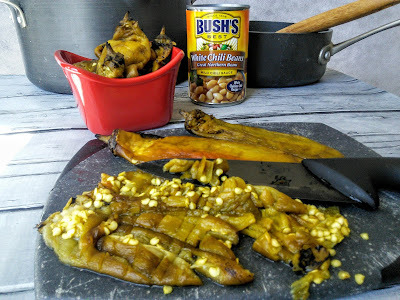 I bought several cans of the While Chili Beans along with some of the other varieties of the Bush's Bean Chile Beans as I wanted to taste them for future recipes. I use beans a lot in my cooking and my head was already planning recipes like tacos, chili, breakfast burritos, and more. So once I got home from Walmart, I just had to open up a can of the White Chili Beans. 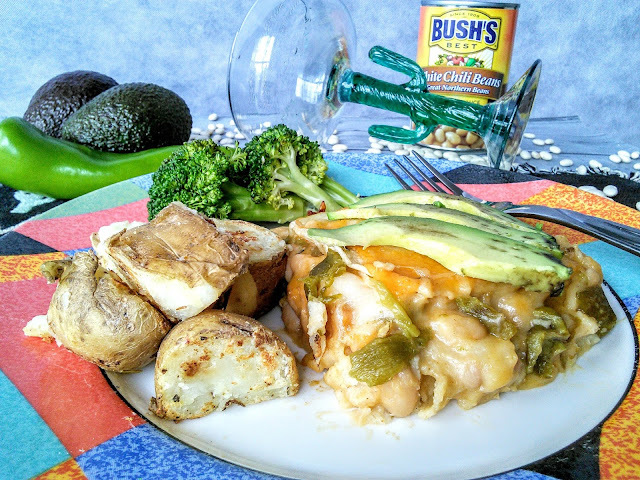 These beans had an awesome flavor and I knew that the addition of green chile would make fabulous enchiladas. So I got to work right away assembling my green chile enchiladas. 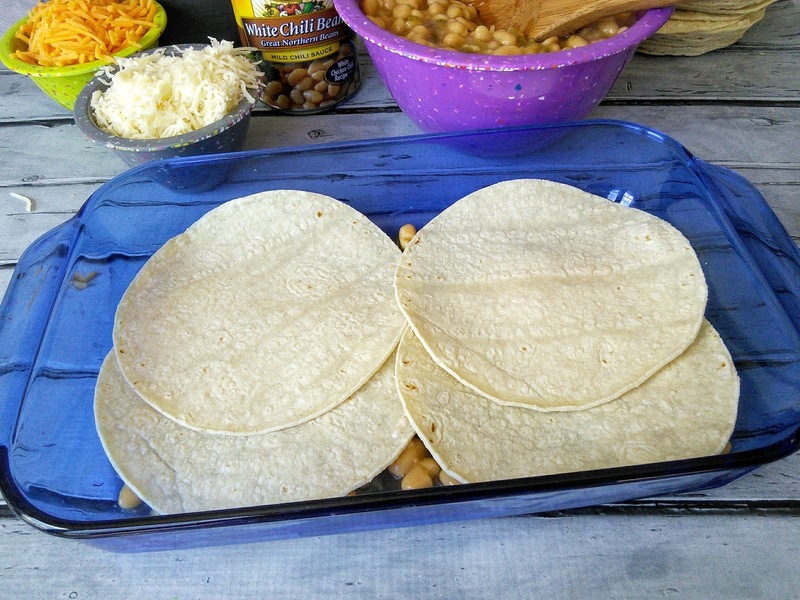 I like to layer my corn tortillas along with the beans and cheese in a baking dish. This method is so much easier and less messy. This recipe is great for potlucks and parties. You can easily double the ingredients. 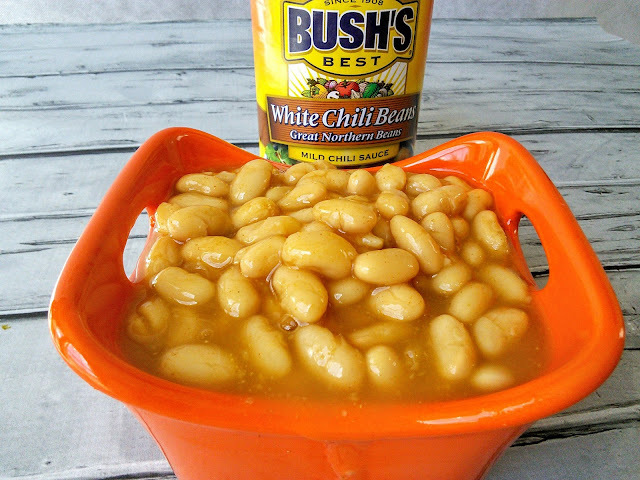 I just love the flavorful sauce that is in the Bush's White Chili Beans. The sauce had a mild flavor so I knew adding green chile to the beans would give it some spice and heat that my family loves. 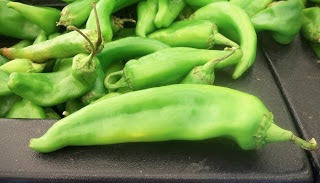 I like eating medium heat green chile but you can buy those tasty green peppers in mild, hot and extra hot. Mmm, fresh roasted green chile is the best. Did you know that green chile is high in vitamin C? 2. In another bowl, combine the two types of cheese and evenly divide into three bowls. 3. In a large baking dish (9X13) spread some of the bean mixture to just lightly coat the pan. 4. Place 4 tortillas evenly on the sauce and then layer one bowl of the white chili bean mixture followed by one bowl of cheese mixture. 5. Place 4 more tortillas on top followed by the other bowl of beans and one bowl cheese. 6. 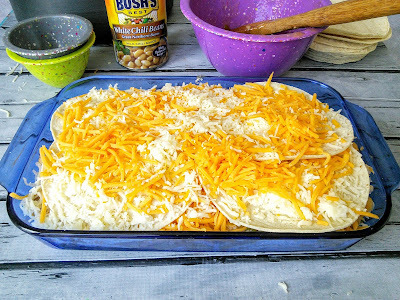 Place the remaining 4 tortillas on top and even spread the remaining cheese on top. 7. Bake for 20 minutes or until or the cheese is melted and gooey. 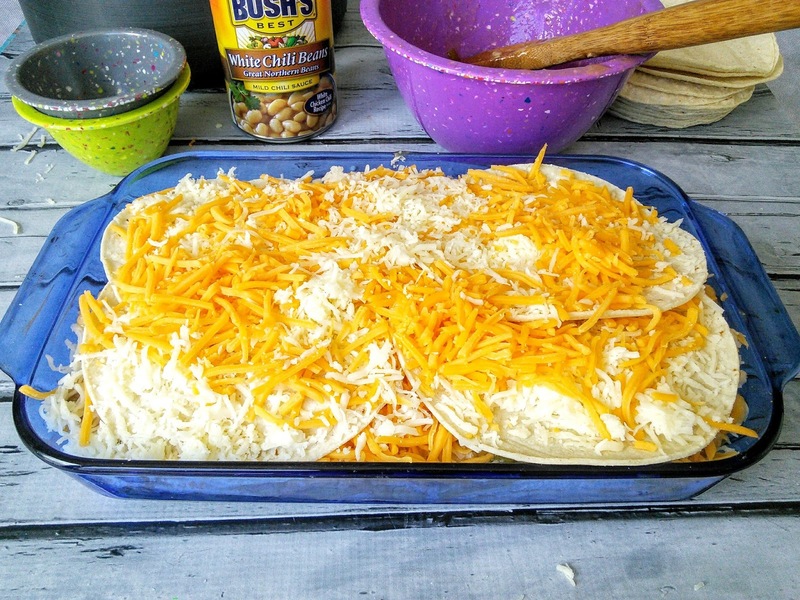 Tip: Make sure to spread the beans and cheese evenly on each layer. Once you make this recipe a couple of times, there will be no need to divide all the ingredients as you will have a feel for how much to put on each layer. If you want to add more layers or make in a bigger pan, just double the ingredients. My family loved the enchiladas and said that they had great flavor. That great flavor came from the Bush's White Chil Beans. 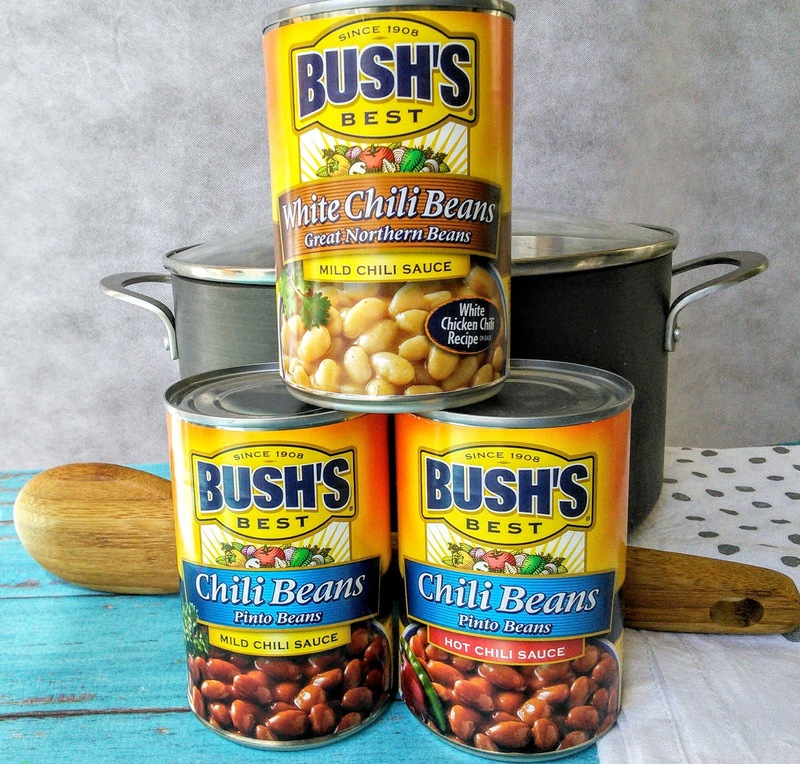 I am excited to create some other wonderful fall meals with the other varieties of Bush's Chili Beans. Yum I am salivating at these pictures! I haven't had enchiladas in a long time, I might just have to make this! Oh now these sound absolutely delicious - I haven't had enchiladas in well I don't remember how long so I need to try these! Baked beans is my favorite and this sounds like an easy recipe to follow. I might've to try making this since my family enjoys it. This sounds like a really yummy dish, and I have peppers crowing in my yard. I don't think I have seen the White Chili Beans yet either, but I will definitely be looking for them now. I really prefer great northern beans to kidney beans, so this is awesome! These look fantastic! 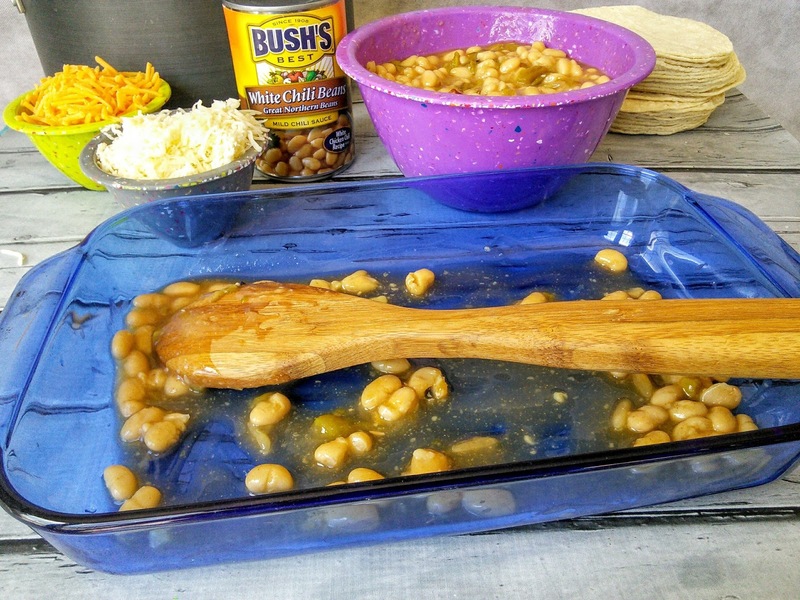 I love using canned beans in dishes just for the ease of it! I don't see much point in cooking them myself! Am reading this, just in time for dinner. Looks yummy! Cant say we have ever tried anything like this. Looks really good...and simple! 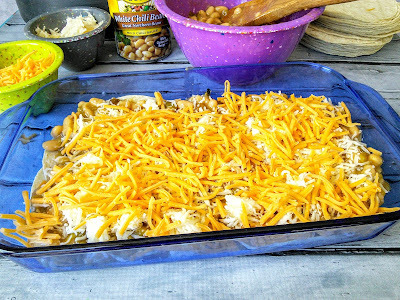 It has been forever since I made enchiladas and this looks like a tempting and yummy. I have never used canned beans in enchiladas before and was curious about the inspiration to do so? Canned beans are a staple in my house as a frugal momma and am looking forward to trying. Great recipe for the Fall or anytime for that matter. I've been a fan of Bush's since I can remember so I know that this taste's great! This recipe looks so delicious and easy to make. I will have to get the ingredients I need to make some this weekend. I am sure they will be a big hit. This looks like a really yummy and easy recipe to make. I love Bush's White Chili Beans. I do like enchiladas and this dish looks yummy. Um, yes please and thank you! We LOVE green chilies, so this would be a perfect recipe for my family! These look so good. My kids would hate that they have beans though. They are so sick of beans. Oh my goodness, this looks amazing!!! All of that cheese oozing out is what caught my eye! Gonna print this out and make it for one of my Friday Halloween movie night! I'm not really a green chile fan, but this looks so good! I'll have to make it for my family sometime soon and see what they think of it! Thanks for sharing! OH yummy! This looks SO good. I'm sure my family would eat this up in a second.